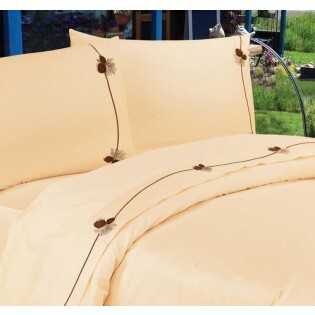 Our cream color Embroidered Pinecone Sheets are embellished with a delicate trellis of pine cones that enhance the 350 thread count, 100% cotton sheets. Our cream color Embroidered Pinecone Sheets are embellished with a delicate trellis of pine cones that enhance the 350 thread count, 100% cotton sheets. These sheet sets are designed to fit deep pocket mattresses. Your rustic pinecone sheet set includes one flat sheet, one fitted sheet and two pillow cases (one with twin). These pinecone sheets will add the finishing touch to your rustic bedroom.